This is Hillary Rodham Clinton in the 1970s, back when she made herself to be bizarrely ugly, and badly-dressed. Unsurprisingly, it was during her aggressively feminist years. This, on the other hand, is beautiful Hillary photographed by Vogue magazine (by orders of good chum, Anna Wintour, to boost the First Lady's image after the Lewinsky scandal). Same woman. Same staunch feminist, no doubt. But two very different kinds of images being conveyed. Observing physical qualities of women is not inherently sexist. It is sexist when that's all you notice. There were serious questions about the constitutional eligibility of Hillary Clinton to serve as secretary of State. The issue arises from a vote held to raise the Secretary of States salary. Senator Hillary Clinton voted for this increase. The Constitution forbids members of the Senate from being appointed to civil office, such as the Secretary of State, if the "emoluments," or salary and benefits, of the office were increased during the Senator's term. 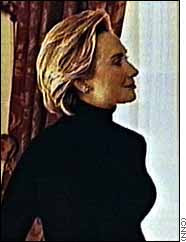 Hillary can look pretty decent when she's got the right stylists. But then, almost anyone can. It is sexist when that's all you notice. You are aware just how many negative posts you make about how certain women look, right? Enough to make you appear sexist, by your own definition. You can. It's your blog. Its just a bit odd, that's all. 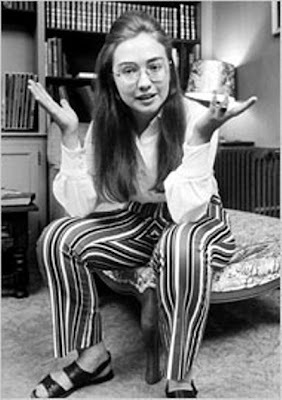 Besides, Hillary's style in the 70's wasn't bizarre for the time. It was pretty much how everyone I knew dressed and looked. You'll look back at photos of yourself in thirty years and shriek with laughter at'that hair', 'those shoes', 'those pants'. Everyone does. Beau: I think Victoria was just being polemic here. Nobody thinks HRC is ugly or beautiful. Those are intangible extremes. I think her point is about image projection, which is important in its own right. I think Victoria was just being polemic here. Maybe. When three of four consecutive posts criticize the physical qualities of particular women (all to the left, politically) one wonders. Beau, put a sock in it. Apart from the fact that Chickenlittle is absolutely right about the intent of this post (which is palpable to anyone with half a brain), women are as hard-wired to speak about each other's physiques, as men talk about their power. And on Sundries, Viagra doesn't trump Vogue.